Iran's President, Mohammad Khatami, has hardened his position on the country's election row by demanding a fair and free poll. He urged the unelected Guardian Council which has disqualified more than 3,000 candidates from next month's elections, to make a full review of its decision. He has tried to find a solution by holding talks behind closed doors. Mr Khatami's comments indicate his patience is wearing thin with the country's hardline conservatives. In a joint statement with the parliamentary speaker, Mehdi Karrubi, Mr Khatami accused the leader of the Guardian Council, Ayatollah Ahmad Jannati, of misrepresenting their views at a meeting with him last Saturday. The president met members of the Guardian Council - which vets all candidates in elections - in an attempt to persuade them to reverse their controversial decision to disqualify thousands of reformist candidates from the parliamentary poll. Mr Khatami's statement indicates that his mission has brought no significant result. He has warned the conservatives that as a result of the disqualification more than two-thirds of constituencies would have no competing candidates in the elections. He said if the elections were held in this situation, it would be against democracy and against the dignity of the Iranian people. 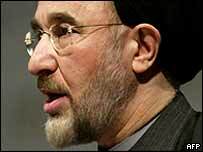 Mr Khatami did not make it clear what his reaction would be if the situation was not reversed. But it appears that his options are limited and his moderate policies are having little effect. "The Guardian Council did make a small concession"